The tenant rejection letter is a formed used by a landlord or manager to inform an applicant for residential housing that their application was denied. This is most commonly due to red flags in the applicant’s criminal or credit background report. Receive a Copy – Within 60 days the tenant is able to make a written request to Equifax, Experian, or TransUnion to receive a copy of the report. Download the form in Adobe PDF, Microsoft Word (.docx), or Open Document Text (.odt). Before providing the official reason for rejection, it will be important to Identify a few items regarding the Application being rejected. First enter the current Date on the first line (labeled “Date”). 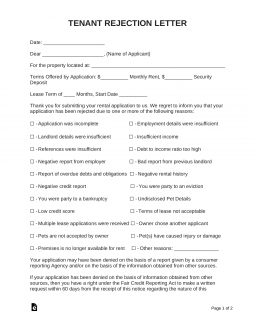 To further report on the applied property, enter the “Monthly Rent” and the “Security Deposit” required for the rental property the applicant applied for using the two blank spaces on the next line. The next line will request the “Lease Term” of the rental to be entered. That is, enter the Number of Months the proposed Rental Property would have been rented for on the line after “Lease Term of” then, on the blank line after “Start Date,” record when the intended Execution Date of a successful lease would have been. The next statement will provide the initial language required for a rejection, however the reason will need to be provided. This may be done by checking one or more of the list items present. The first column will have a check box corresponding to one reason. Each reason will directly address the applicant. Place a mark in each box that applies. This column will allow you to name one or more of the following reasons: “Application was incomplete,” “Landlord details were insufficient,” “References were insufficient,” “Negative report from employer,” “Report of overdue debts and obligations,” “Negative credit report,” “You were party to a bankruptcy,” “Low credit score,” “Multiple lease applications were received,” “Pets are not accepted by owner,” and “Premises is no longer available for rent.” Check all the statements that apply to why this application is rejected. Do not check inapplicable reasons. 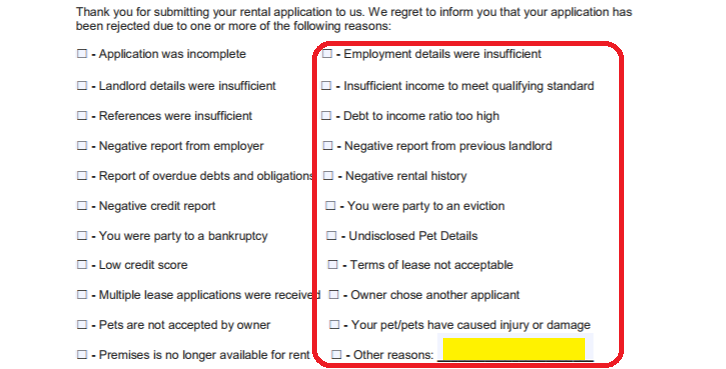 The second column will also provide a list of reasons for rejection along with a check box that corresponds to each statement. You should mark each check box that accurately describes the reason for rejection. Note: At least one reason from one of these columns should be checked. If there is more than one in either or both columns, you should check all that apply. 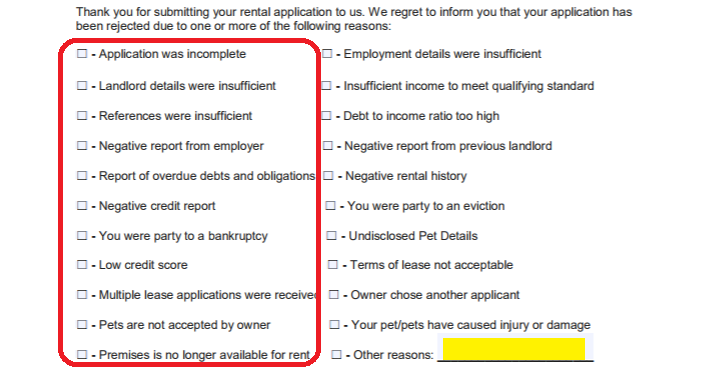 The definitions provided will address the tenant directly, you may mark the box labeled: “Employment details were insufficient,” “Insufficient income to meet qualifying standard,” “Debt to income ratio too high,” “Negative report from previous landlord,” “Negative rental history,” “You were party to an eviction,” “Undisclosed Pet Details,” “Terms of leas not acceptable,” “Owner chose another applicant,” “Your pet/pets have caused injury or damage,” and “Other reasons.” If you choose “Other reasons,” define the reason for rejection on the blank line provided.